We hear so much about presidential candidates–and so little about life in the states that elect them. In “Beyond the Circus,” writers take us off the trail and give us glimpses of politically important places. Today, Janesville. In his speech to the Republican National Convention, Paul Ryan portrayed himself as an emblem of his Midwestern hometown, where he lives on the same block where he grew up and attends the same church in which he was baptized. I have lived in Ryan’s hometown–Janesville, Wisconsin–off and on for the past 20 years, and have learned that its story is more complicated, and more important, than that. Janesville is a city of about 63,000 located 40 miles south of Madison. In addition to its outstanding public library, lush Rotary Gardens, and plethora of historically significant domiciles, Janesville has so many retail outlets (two huge malls) and restaurant franchises that people call it “Chainsville.” The city is a merchandise center for the surrounding area–over half a million people live within 30 minutes. It also is a Rust Belt town that, not unlike the United States, is slouching toward some sort of reinvention. But let us not get ahead of our story. Janesville is a fine specimen of American history, and this isn’t its first brush with presidential politics. Abraham Lincoln stopped here twice, first when he was a young man helping to clear out the Blackhawk Indians so that white settlers could develop the Rock River for commerce; and later when he was unofficially running for president in opposition to the further spread of slavery. Then he stayed for a single night at an Italian villa newly built by a lawyer named Tallman; it is now called the Lincoln-Tallman House and stands, albeit in need of repairs, next to the Rock County Historical Society. Tourists still stop by the Lincoln-Tallman house, but fewer than used to. Many weddings in American family history have been enhanced by “I Love You Truly,” a tremolo paean to love written by Carrie Jacobs-Bond, originally from Janesville. And what would we do without the spirited aphorism “Laugh and the world laughs with you, Weep and you weep alone,” penned by Ellen Wheeler Wilcox, also from Janesville? One in five of the Wisconsin houses on the National Register of Historic Places rest on their foundational laurels in Janesville. There are 10 different historical neighborhoods, of which my family has lived in two. Courthouse Hill has one of the best collections of Gilded Age homes in the United States. Our current historic district, Columbus Circle, is chock-a-block with 1920s bungalows of almost every conceivable form: Tudor, Dutch Colonial Revival, Mediterranean, Cape Cod, and Prairie Style. As for Native American history, the most recent major event since the Blackhawk War of the 1830s was the birth of “Miracle,” a white buffalo accorded wondrous status by Native American tribes, who gathered in droves at a farm just west of town to behold him. Miracle lived from 1994 to 2004. “Second Miracle” was born in 2006 but was felled by lightning at an early age. Parker Pen Company, once the largest maker of writing instruments in the world, used to be a big employer here, but a consortium bought and downsized it two decades ago. Now, if you want a Parker Pen in Janesville, you go to Staples. 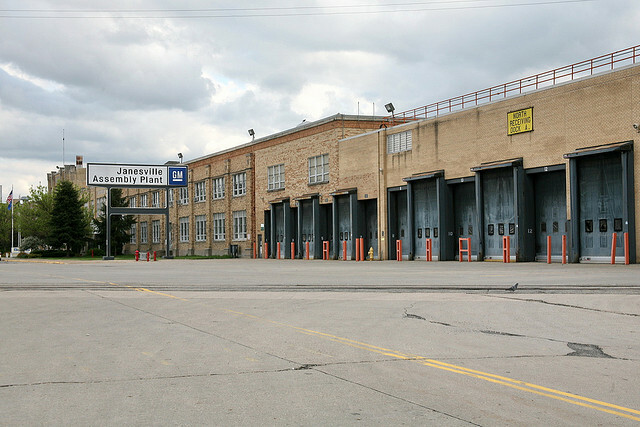 The old Janesville Machine Company, which in 1919 was bought by General Motors and merged with the Samson Tractor Company, was the oldest General Motors assembly plant in North America until GM closed the plant for good in 2008. In my old hometown of Waco, Texas, residents long believed that no tornado would ever strike the city (it was an old Huaco Indian legend). They were accurate until 1953, when true believers failed to heed storm warnings and became victims of one of the worst storms in American history. Janesville had a similar type of magical thinking: “GM will never close. They’ve been talking about it for years. But it just never does.” Well, it did. General Motors was once the biggest purely commercial employer in town. Now Wal-Mart is. Workers making $29 an hour left Janesville or switched to jobs that paid $8.50 an hour; or they retired early with much less money; or they decided they could never afford to retire. Some lost everything. Janesville had been a GM town. It had also been a union town. What followed this debacle–when GM closed, a lot of other, allied companies shut their doors, too–was what documentary filmmaker Brad Lichtenstein, director of the forthcoming As Goes Janesville, has called a “golden moment” of cooperation. Democrats and Republicans, labor union members and bankers: all came together to see what could be done. They tried to get GM to change its mind (it has not), and they tried to get ownership of the abandoned facility (they never have), and they tried to attract new business (with some success). Janesville is strategically located in reasonable proximity to Chicago, Milwaukee, St. Louis, Des Moines, and Minneapolis. Interstate 90 sweeps along just east of the city. Already, there are signs that Janesville is attracting distribution centers. These jobs do not pay as well as “Generous Motors” did, but there are other promising shoots in the garden, such as a coming manufacturer of isotopes for cancer treatment. But can Janesville re-cast itself as a high-tech city in a region far removed in every way from Silicon Valley? Whatever results from the “golden” collaboration of which Lichtenstein spoke, Janesville embodies much of what has divided America in the early 21st century. It is the hometown of ex-Senator Russ Feingold, famed for his attempts to limit the influence of big donors over regulatory policy and to slow American military adventures overseas. Feingold is the latest incarnation of Wisconsin Progressivism, rooted in the community-minded reform movements imported from Germany and Scandinavia. But Janesville is also hometown to Paul Ryan, who comes from a different tradition: that of the entrepreneur who starts a business (for example, Ryan Construction, founded by Paul’s forebears). The entrepreneur prefers to have as few taxes and regulations as possible. The Wisconsin progressive yearns for the middle-class security once guaranteed by high-paying union jobs, often held by those with no more than a high school education. The entrepreneur envisions a more “dynamic” America, one fueled by the risk-taking of entrepreneurs, free of the demands imposed by collective bargaining. These competing visions have come to a head in disputes such as that between Wisconsin’s conservative governor, Scott Walker, and his bitter foes, the public employee unions. They have also created a rift, after the closure of the GM plant, between those who believe prosperity is founded on protected jobs and those who are glad the United Auto Workers are gone. Janesville is a place where the profound dislocations of globalization and outsourcing are on painful display. A decade ago I happened to be in one of the city’s two big shopping malls at a chain eatery called “The Old Country Buffet.” A 50-something GM worker, wearing a pants suit, had just finished a hard week of work. But it was payday, she had her grandkids with her, and they were delighted to be eating all of the pork chops and banana pudding they wanted on a Friday night. Such comfort and assurance, after so much hard work, seemed deeply right to me. Today in Janesville, that seems like a time that may never come again. But these days, it also feels like a new chapter is aching to be born. Tom McBride is a professor of English at Beloit College, and coauthor, with Ron Nief, of the Annual Mindset List and The Mindset Lists of American History (Wiley, 2011).